湖泊科学 2016, Vol. 28 Issue (1): 50-58. DOI: 10.18307/2016.0106. 燕婷, 刘恩峰, 张恩楼, 李艳玲, 沈吉, 抚仙湖沉积物重金属时空变化与人为污染评价. 湖泊科学, 2016, 28(1): 50-58. DOI: 10.18307/2016.0106. YAN Ting, LIU Enfeng, ZHANG Enlou, LI Yanling, SHEN Ji. The spatio-temporal variations of heavy metals in the sediment of Lake Fuxian and the contamination assessment. Journal of Lake Sciences, 2016, 28(1): 50-58. DOI: 10.18307/2016.0106. 摘要：分析了抚仙湖表层沉积物及沉积短岩芯中10种金属元素含量, 结合沉积年代学, 定量研究了Cr、Cu、Ni、Pb、Zn的污染特征及时空变化规律; 参考沉积物质量基准与潜在生态风险指数法探讨了表层沉积物重金属的潜在生态风险.结果表明, 表层沉积物中重金属含量具有一定的空间差异性, 近岸地区重金属含量总体上高于湖心区; Pb、Zn含量自1980s中期以来逐渐增加, 而Cr、Cu、Ni含量呈下降趋势.重金属富集系数与聚类分析结果表明, 抚仙湖沉积物主要重金属污染元素为Pb、Zn, 污染开始于1980s中期, 并逐渐加重.表层沉积物中Pb、Zn富集系数分别为1.6~4.1和1.4~2.6, 已达到弱中等污染程度, 北部湖区污染程度略高于南部湖区; 除此之外, 北部湖区近岸区域Cr污染程度也略高于其他湖区.除了大气沉降来源之外, 抚仙湖沉积物重金属污染还可能与入湖河流输入有关.单因子生态风险指数表明, 表层沉积物中Cr、Cu、Ni、Pb、Zn具有较低的潜在生态风险; 而综合潜在生态风险指数表明, 表层沉积物中重金属具有中等程度的潜在生态风险, 这与根据沉积物质量基准所获得的评价结果一致. Abstract: Concentrations of metals in the surface and core sediments of Lake Fuxian were determined. 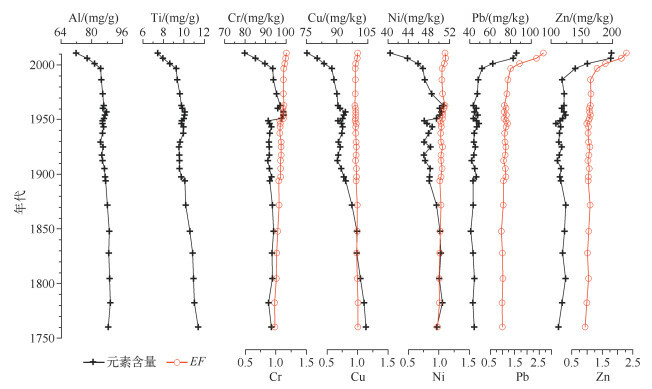 The spatio-temporal features of contaminations Cr, Cu, Ni, Pb and Zn were discussed, referencing to the enrichment factor method and the chronology of the sediment core. Potential eco-risks of the heavy metals in the surface sediments were discussed on base of combining the potential ecological risk index and sediment quality guideline assessments. The results showed that metal concentrations exhibited some spatial variations with general higher concentrations in the near shore area than in the lake center. Concentrations of Pb and Zn have increased typically since the mid-1980s, whereas concentrations of Cr, Cu and Ni have decreased. Pb and Zn should be influenced by human contamination as indicated by the hierarchical analysis and the enrichment factors.The metal contamination began at the mid-1980s and showed an increasing trend. Enrichment factors of Pb were between 1.6-4.1 and Zn between 1.4-2.6 in the surface sediments, reflecting minimal to moderate contamination levels, where the values were decreased from the north lake to the south. Moreover, the sediment in the near shore region of the north lake was also contaminated with Cr. The riverine input should be also a reason for the heavy metal contaminations in the sediment of Lake Fuxian, additionally the atmospheric deposition. Metals Cr, Cu, Ni, Pb and Zn in the surface sediments may have low potential eco-risk estimated on the potential ecological risk factor. 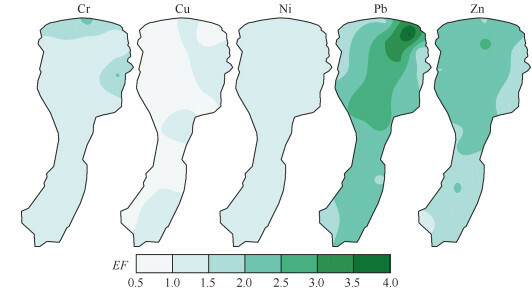 However, the metals may be of a moderate potential eco-risk according to the potential ecological risk index, which is consitent with that from a baseline of the sediment quality assessment. 沉积岩芯样品冷冻干燥后，210Pbtot、226Ra 及137Cs 活度采用美国EG & G Ortec公司生产的高纯锗井型探测器(HPGe GWL-120-15)测定，根据Appleby等的计算方法获得210Pbex活度.137Cs 和226Ra 标准样品由中国原子能科学研究院提供，210Pb 标准样品由英国利物浦大学做比对标准，测试误差小于10 %. 表层沉积物及沉积岩芯样品冷冻干燥、研磨后，经HCl HNO3 HF完全消解后，采用美国Leeman Labs Profile电感耦合等离子体原子发射光谱仪(ICP-AES)测定金属元素(Al、Fe、Ti、V、Co、Cr、Ni、Cu、Pb、Zn)含量.分析过程中采用标准参考物质GBW07358(GSD-15)进行精度比对，各元素的最大误差均小于7 %. Håkanson提出的重金属综合潜在生态风险划分标准是基于As、Hg、Cd、Cr、Cu、Pb、Zn和PCB 8种元素的RI值[12, 29]，本文只分析了Cr、Cu、Pb、Zn和Ni 5种元素，采用Håkanson提出的原有RI等级划分，会低估重金属的综合潜在生态风险.参考Zhang等的方法，根据所分析的5种重金属的毒性系数与8种元素毒性系数的比值，对重金属综合潜在生态风险指数阈值进行调整，结果见表 1. 我国在沉积物质量基准研究方面起步较晚，由于沉积物中金属污染物化学行为的复杂性，国外已有的沉积物质量基准中重金属含量阈值存在一定差异.MacDonald等在综合已有沉积物质量基准以及统计学和毒性实验结果验证的基础上，建立了普适的淡水水体沉积物重金属质量基准(Consensus-Based SQGs，CBSQGs)，对沉积物中Cr、Cu、Ni、Pb、Zn毒性具有较高的辨识准确性(90 %).CBSQGs包括阈值效应含量(threshold effect concentration，TEC)和可能效应含量(probable effect concentration，PEC)，不同阈值反映了重金属产生生物毒性的概率.若沉积物金属含量低于TEC，则该金属不会对底栖生物产生毒性效应；若沉积物某金属含量高于PEC，则该金属会产生毒性；如果金属含量在TEC和PEC之间，则可能产生毒性效应. 沉积物中金属元素聚类分析采用IBM SPSS statistics 19统计软件，表层沉积物重金属浓度与富集系数空间分析采用Suffer 8.0软件，采用克里格插值方法. 沉积岩芯中137Cs、210Pbex活度与Liu等2005年在同一位置采集的沉积岩芯结果相似，沉积岩芯6.5cm处137Cs 存在显著的1963年全球核爆试验大气沉降峰值.210Pbex活度随深度增加呈指数降低(R2＝0.78).沉积岩芯中137Cs 与210Pb 变化特征指示了较为稳定的沉积序列.采用复合模式(composite model)建立沉积岩芯的年代序列[27, 31]，年代结果见图 2.沉积岩芯24~28cm年代采用沉积岩芯22~24cm平均沉积速率外推，所得沉积岩芯底部年代为1760年左右. 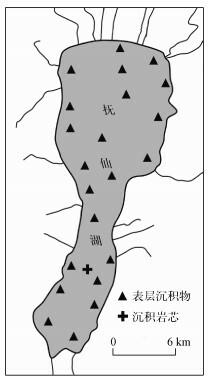 抚仙湖表层沉积物及沉积岩芯中金属元素含量变化较大(表 2).表层沉积物与沉积岩芯中10种金属元素具有相似的组合特征，均可划分为2组，第Ⅰ组元素包括Al、Fe、Ti、V、Co、Cr、Cu和Ni，第Ⅱ组元素由Pb和Zn组成(图 3).表层沉积物两组元素在近岸湖区含量较高(图 4)；沉积岩芯中第Ⅰ组元素总体呈逐渐降低趋势，而Pb与Zn自1980s中期以来逐渐增加(图 5)，这与王小雷等的研究相似.沉积物中Al、Fe、Ti等铝硅酸盐类元素主要为流域自然来源，其含量通常与沉积物粒度等因素有关；而Pb、Zn与其他金属具有不同的组合特征，说明除了流域自然来源之外，还可能受到人为污染的影响. 理论上，EF＞1即可认为沉积物中重金属受到人为污染的影响，但考虑到参比元素校正的误差及不确定性，参考Co、V等金属元素的EF变化，认为EF＞1.1可表示沉积物中重金属受到人为污染的影响.参考Sutherland根据沉积物重金属EF划分的污染等级，抚仙湖表层沉积物及沉积岩芯中Cu、Ni为无污染至弱污染等级；而Cr受到一定程度人为污染的影响，尤其是北部湖区部分近岸区域，但仍属于弱污染等级.表层沉积物中Pb、Zn属于弱中等污染水平，北部湖区污染程度显著高于南部湖区；表层沉积物中平均有51 % (33 % ~73 %)的Pb、45 % (20 % ~57 %)的Zn来自人为污染贡献.时间上，抚仙湖沉积物重金属污染开始于1980s中期，近10年来人为Pb、Zn沉积通量为55和119mg/(m2·a)，人为污染贡献量已接近其自然分量(60、162mg/(m2·a)).沉积岩芯记录的抚仙湖重金属污染历史与流域工业经济快速发展的特点完全吻合，也与西南地区的阳宗海、红枫湖等湖泊重金属污染历史过程较为一致，反映了西南地区经济发展导致的重金属污染在时间上具有很强的一致性.Zhao等和Zhang等的研究表明，大气沉降是西南地区湖泊重金属污染的主要输入途径，主要来源于有色金属冶炼释放.虽然目前尚无抚仙湖主要入湖河流重金属污染状况资料，但根据表层沉积物重金属富集系数变化规律，我们认为抚仙湖沉积物Pb、Zn污染除了大气沉降之外，还可能与入湖河流输入有关，来源于毗邻的城镇及工矿区废水排放；北湖湖区近岸地区Cr污染主要与入湖河流输入有关，可能来源于毗邻地区工业废水排放. Vicente-Martorell JJ, Galindo-Riaño MD, García-Vargas M et al. Bioavailability of heavy metals monitoring water, sediments and fish species from a polluted estuary. Journal of Hazardous Materials, 2009, 162(2/3): 823-836. 曾海鳌, 吴敬禄. 近50年来抚仙湖重金属污染的沉积记录. 第四纪研究, 2007, 27(1): 128-132. 王小雷, 杨浩, 顾祝军等. 抚仙湖沉积物重金属垂向分布及潜在生态风险评价. 地球与环境, 2014, 42(6): 764-772. Yalcin MG, Simsek G, Ocak SB et al. Multivariate statistics and heavy metals contamination in beach sediments from the Sakarya Canyon, Turkey. 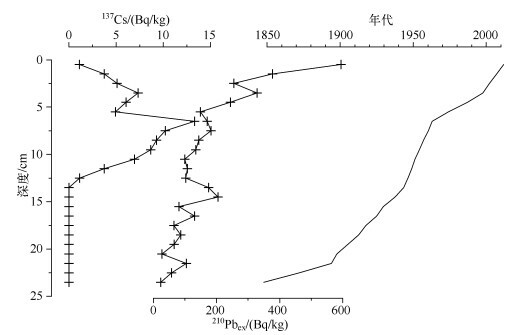 Asian Journal of Chemistry, 2013, 25(4): 2059-2066. 张杰, 陈熙, 刘倩纯等. 鄱阳湖主要入湖口重金属的分布及潜在风险评价. 长江流域资源与环境, 2014, 23(1): 95-100. Zeng J, Yang LY, Chen XF et al. Spatial distribution and seasonal variation of heavy metals in water and sediments of Taihu Lake. Polish Journal of Environmental Studies, 2012, 21(5): 1489-1496. 李晓铭, 赵世民, 王道玮等. 滇池表层沉积物中重金属污染特征及评价. 地球与环境, 2013, 41(6): 647-655. 王小雷, 杨浩, 赵其国等. 云南抚仙湖近现代环境变化的沉积物粒度记录. 沉积学报, 2010, 28(4): 776-782. 龚墀, 张立仁. 抚仙湖沉积物粒度特征. 沉积学报, 1983, 1(1): 50-62. 王苏民, 窦鸿身. 中国湖泊志. 北京: 科学出版社, 1998. 宋媛媛, 冯慕华, 苏争光等. 抚仙湖不同来源沉积物磷形态垂向分布特征. 环境科学学报, 2013, 33(9): 2579-2589. Smith VH, Tilman GD, Nekola JC. Eutrophication:impacts of excess nutrient inputs on freshwater, marine, and terrestrial ecosystems. Environmental Pollution, 1999, 100(1/2/3): 179-196. Appleby PG. Chronostratigraphic techniques in recent sediments. In:Last WM, Smol JP eds. Tracking environmental change using lake sediments. Dordrecht:Springer Netherlands, 2001, 171-203. 刘恩峰, 薛滨, 羊向东等. 基于210Pb与137Cs分布的近代沉积物定年方法-以巢湖、太白湖为例. 海洋地质与第四纪地质, 2009, 29(6): 89-94.